The following story reminds all of us to be vigilant to avoid delay in diagnosis and treatment of childhood cancer. 15 year old Murugesan from Sukkampatti (Pudukottai Dist) was a happy school- going kid until November 2011, when he started having fevers at least three or four times a week; and his eyes became slightly protruding and bulging. The third physician who saw him found his blood tests were abnormal and suspected leukemia (cancer of white blood cells). However, he went from hospital to hospital – four of them in all, including three major hospitals, over a period of 7 weeks —without receiving any treatment. By this time Murugesan’s both eyes were so swollen that he could not even close his eyes; as a result his eyes were very dry and his vision was getting more blurry every day. Finally he was referred to our Camila Children’s Cancer Centre at MMHRC, where he is receiving modern treatment for a form of blood cancer (acute myeloblastic leukemia, AML)—completely free of cost. He is already responding to the treatment very well; and he will receive a total of 9 cycles of chemotherapy, lasting for about a year. 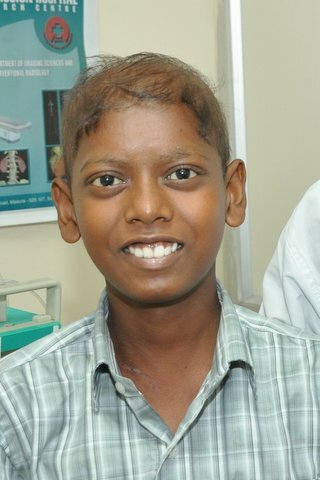 Murugesan’s treatment could have been started almost 7 weeks earlier, and his vision completely preserved. And his chances of cure would be even better. Delay in diagnosis and treatment increases the numbers of resistant cancer cells and markedly decreases the chance of cure for the child.